I am so excited to introduce you to an amazing friend (and past client) of mine, Josee-Anne Sarazin-Cote. She is a prolific lifestyle blogger, author, speaker, podcast host, and all around inspiration. Josee-Anne completely transformed her mindset and business to allow her to go from working 75+ hours a week and making very little money to hosting sold-out events and retreats all around the world. She is now working around 20 hours per week and is on track to bring in half a million in revenue this year! What is takes to persevere during those early years when you’re working long hours and not making much money, and what kept Josee-Anne going during that time. This episode is especially helpful if you’re in the beginning phases of your business and need some encouragement to keep on working towards your goals. P.S. Doors are now open for my 6 Month Mastermind! I’ve created this special opportunity for women who are ready to scale to 6-figures in the next 12-18 months. If you’re interested in joining us, you can read more about that here. 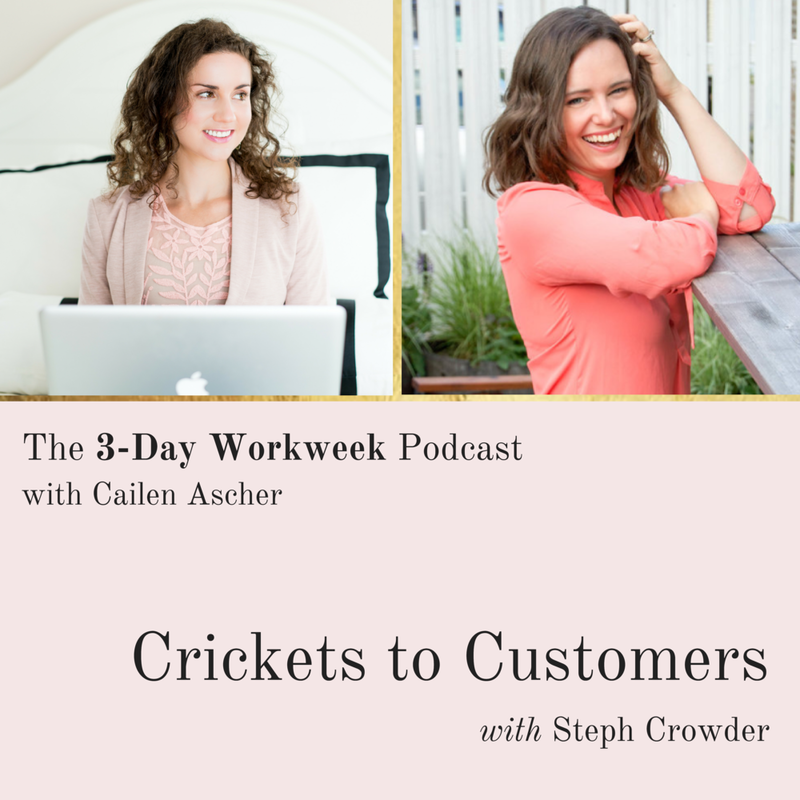 I am beyond excited to bring you today’s episode with Steph Crowder. Steph is a podcast host and business coach who helps entrepreneurs find the courage & the clarity to go after what they love. You might know Steph from her work with Fizzle or from her own podcast, Courage and Clarity. After you listen to this week’s episode, head over to Steph’s site to download her FREE 15 Minute Weekly Planner Guide, which will help you plan your whole week for business growth in just 15 minutes. I remember back in the early days of my business thinking that there must be a “secret” that 6-figure business owners all understand. Because, at that time, I was struggling to make a part-time income working full-time hours. And you know what -- I was right! They did know something that I didn’t...and I’m sharing that secret with you today because I bet you’re wondering the same thing I was. This secret is so simple that it may seem silly when I share it, but it’s the KEY to reaching the 6-figure level in your business. Believe me -- I know from personal trial and error. 6-figure business owners believe 100% in their dreams. That’s it. They believe so much in their dreams that they are non-negotiable and therefore inevitable. If they hit an obstacle or things don’t turn out the way they envisioned, they don’t give up or doubt themselves or sulk. They think: What can I learn from this? What can I do better next time? What is something else I can do to achieve this goal? Now telling you to believe in yourself and your dreams is one thing. Giving you the tools to enable that occur is another. So, I’ve got 2 tools for you that will foster your self-belief and help you create the life of your dreams, and they are available to you right here and right now. Your thoughts create your world. So if you’re vibing in a place of self-doubt, worry or lack -- guess what’s going to be showing up for you. More things that confirm those feelings. If instead you make a conscious choice with each passing moment to focus on the good that surrounds you (no matter how small), more good will begin to flow into your experience. Without your mindset on board, 6-figure success will continue to elude you. (Believe me, I know from personal experience.) Before we can upgrade our finances, we must first upgrade our internal wealth consciousness. Replace negative thoughts with positive affirmations. Replace limiting beliefs with reasons why your dreams are meant to be. P.S. Your dreams are meant to be, by the way. So, what does your community (or lack thereof) say about you? Are you surrounded by high-vibing, BIG dreamers with gorgeous goals and positive attitudes? Or are you feeling pulled down or judged by the people around? If you’re looking to up-level your business, your mindset, your happiness, your wealth, ANYTHING, you need to surround yourself with people who get that and support and love you through the ups and downs. You deserve that! You need that. When I started my dive deep into mindset work and began to actively seek out (and invest in) the mentors and community support I needed, my revenue 3X from one year to the next. In 2015 I brought in just under $30,000 in my business (for the entire year), and the next year I had a $30K launch in February and crossed the 6-figure mark in October. This is the type of exponential growth that is possible when your mindset and community are both there for you. This is the type of of success you can expect when you believe in your dreams. And this is what I want to help you create for yourself + your business in the coming year. I’m putting together a 6 Month Mastermind for women who are ready to drop the hustle mindset and reclaim their time, energy and power so they can sustainably scale to 6-figures while working flexible, part-time hours. If you’re currently having $3,000 months in your business, and are ready for the support, tools and tribe necessary to breakthrough to your first 6-figure year, this experience is for you. Simply book a time to chat with me here to ensure this is truly a good fit for you at this time. Want some extra support around moving from Doing to Flowing? Let’s chat about how we can work together in the new high-level mastermind I’m putting together for 2019. Today is my 33rd birthday. Earlier this month I had 333 women move through the Design Your Life Challenge™ with me, and as you know I have a 3-day workweek. Things are lining up, wouldn’t you say?! In celebration of today, I wanted to give you something that I hope will be immensely useful to you -- my Phases of Business Framework. The Phases of Business Framework is a super helpful e-book that breaks down the stages of business growth so that you can clearly understand what phase you are in now and map out a clear plan to move on to the next. The e-book includes an in-depth profile of each phase as well as tips and resources to help you progress on to the next (and better!) phase. Seem fun + helpful? I hope so! What Phase of Business you are in? For me, knowing which Phase of Business I’m in feels really good and empowering because I’m reminded that it’s just a phase!! And no phase lasts forever -- it’s just a stepping stone on the path to success! P.S. If you’re in the Doing Phase and having steady $3K months, I’d love to help you scale to 6-figures in 2019. I’m putting together an intimate, high-level mastermind to help you move from Doing to Flowing. If that sounds like something that would serve you, and you’re ready for this kind of support, let’s chat. Today I wanted to share with you my journey from $3K months to my first 6-figure year. I personally always find it immensely helpful whenever someone shares their story, and I hope in sharing mine it’s helpful to you. In 2014, I was the typical overworked, under-earning, stressed out entrepreneur. 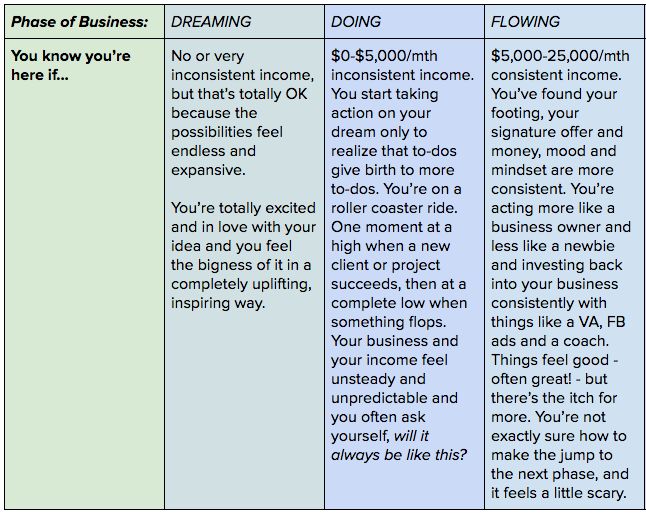 I was running a business in the yoga industry, and the income was sporadic and inconsistent to say the least. Some months I’d make a few thousand dollars, but one month I only brought in $22.50! At that time, my hero was Gary Vee, who encourages you to hustle, hustle, hustle and work 24/7, all the while sacrificing time with friends and family and for yourself in order to “crush it!”. This left me questioning myself, my business and my ability to succeed. I didn’t want to have to work that hard, but it seemed like that was the only option if I wanted to be successful. Then I found out I was pregnant with my first daughter. So you know what I did? I hustled even more to build up enough reserve to be able to take 3 months off after her arrival. She was born in October of that year, and I did my best to not work during my maternity leave and give myself uninterrupted quality time with her. But a cloud hung over this time as well...How was this possibly going to work once my little paradise of maternity leave was over in a few months? There was no way I’d be able to go back to the full-time hustle like before. Not only would it have been impossible timewise with an infant to care for, but also I didn’t want my baby daughter’s first impressions of her mom to be a distracted, always-working, stressed out caretaker who was hustling but barely making it. I wanted her to have tons of quality bonding time with me and vice versa. As I sat with all this, I questioned whether it was even worth going back to my old business at all -- did I really want a business where I was hustling full-time to make what amounted to part-time income? But I didn’t want to give up on my dream of owning my own successful business one day. Even though I’d just had a baby, I felt there was still something within me that still needed to be born: my vision for what it would be like to run the business I knew I was here to create. I realized I needed a new plan if I was going to move forward. I’ve always been the kind of person who can succeed if I trust that I have a strategic plan and workable schedule to follow. When I have a solid plan, it makes me feel anchored and grounded and clear. For me, structure gives me freedom. I pulled out my calendar, and circled the only days that I wanted to work now that my daughter was part of my life: Tuesday, Wednesday, and Thursday. I decided, right then and there, that I was going to make this 3-day-a-week business work. It’s the only way it could work for me, because I wanted and needed that extra time for my new baby. I analyzed every minute of my previous 5-day workweek logically, slicing and dicing it to see what was unnecessary, what could be batched, what could be delegated and outsourced, and what could be cut. As soon as I began looking at my old calendar with this mindset (and this commitment to work only 3 days per week), I realized that I had been focusing on a bunch of stuff that didn’t really matter or wouldn’t make me money. I pulled up a Google Spreadsheet and dragged-and-dropped what was necessary into one of the Tues-Wed-Thurs time slots, and then pressed “DELETE” on everything else. I realized in my previous business (when I was working full-time hours making a part-time income), I was totally trapped in trading hours for dollars. This capped my income at about $3K a month. I also realized that if I wanted to live the mommy-friendly lifestyle I wanted, then I needed to develop a mix of different income streams. This meant carving out space regularly to work on projects and new ideas that would grow my business in addition to still having time to work with my on-going clients. So, I initiated an A/B week schedule. On A weeks, I had all my client sessions, and on B weeks, I my 3 days open and available to work on my business and explore new, exciting opportunities, projects and connections. Because of this format, I was able to develop new offerings and layer my income with recurring revenue streams. I was also able to strategically plan for growth because all of my time wasn’t getting eaten up for too-little-money! Before my shift to the 3-Day Workweek, I was doing business coaching sessions for $75 per hour. With the limited number of coaching spots available after my switch to the 3-Day Workweek, at that rate I would have only been earning just $1,200 a month from coaching -- barely enough to cover groceries. That wasn’t going to work! So, I began reserving my precious few coaching spots for clients who could afford higher investments. My sessions went up to $150 an hour, and then to $200, and then to $375, then $450, then $700, and today my time is valued at over $1000 per hour for one-on-one coaching! If you’re ready to release the hustle mentality and want to learn how to sustainably scale your business, just as I have done, my 6 Month Mastermind is now open for enrollment. It’s for women who are having $3-5K months & are ready to 2X-3X their income and scale towards 6-figures in 2019. Every day, I feel grateful that I get to help clients make the same profound shifts in their lifestyles and business that I made -- earning far more money, in a much more calm, relaxed and sane workweek. For me, one of the most emotionally-moving reminders of why I do the work I do happens every Monday and Friday. Because of my 3-Day Workweek, I get to enjoy 4-day weekends (Friday, Saturday, Sunday and Monday) every single week with my two little daughters and husband. But the reason Monday and Friday are especially significant is I probably would have rarely seen my girls on those days had I not discovered and made the shifts I’m sharing with you. When my second daughter arrived in 2017, my 3-Day Workweek lifestyle was well in place, so I got to welcome her into a calm and peaceful home environment, where all her and my needs were taken care of, because I had created the sustainable business systems and workweek structure to do so. After she was born, I was able to take 4 months off, and because of the systems I had in place, my revenue actually increased 15% that year. Imagine that… two days of each and every week, Monday and Fridays, for the rest of my daughters’ childhoods -- that they have more access to me and me to them -- that never would have happened otherwise. If you consider that most people only have the weekends with their families, this means that I have 100% more time with them than I would have had, had I kept the old, hectic, stressed-out five-day workweek. This has made a huge difference in their lives, and in mine. And I’m so excited to share that difference with you. Inside my 6 Month Mastermind, which is now open for enrollment, I’ll be sharing the exact strategies and systems I’ve used to move from $3K months to $30K launches and 6-figure years. I’ve designed this mastermind specifically for women who are having $3-5K months in their business and are ready for their customized path to 6-figures in 2019. You know that the right support, guidance, community and plan will get you there with ease and flow, and you’re looking for that style of support now. If you’re ready to receive what you need to scale your business to 6-figures while honoring your ideal workweek and lifestyle priorities, welcome home. This mastermind was tailor made for you. On today’s episode we have Britt Bolnick, the founder of In Arms Coaching. She’s a six figure business coach and speaker who is deeply in service to women who are fully committed to building a lucrative business they love that also leaves them time to enjoy life. Britt took herself from a struggling single mother on food stamps to a present work-at-home owner of a thriving small business. Once she grew In Arms Coaching to six figures, she founded a non-profit dog rescue and still continues to lead her heart centered biz with ease, and more free time than most entrepreneurs. How to balance business and kiddos! Many of you here in my beautiful community are moms like me. And, many of you come to me with questions wondering how I create work-life harmony for me, my family and business. Being a present mom and wife is essential for me. Lifestyle is my #1 priority. So that brings me to our conversation today: how to balance business and kiddos! Balance to me is not about static perfection -- it’s about harmony. Finding a healthy ebb and flow. Finding a rhythm that’s sustainable. I see too many women thinking they have to do everything and be everything ALL. THE. TIME. That is not balance -- it’s insanity! Ok, so now that we’ve got that covered, let’s talk through a few key things that have helped me create balance for myself, my family and my business. Do it YOUR WAY -- I’m guessing you may have found me (or at least know about) my 3-day workweek. For years I tried to hustle my way to success, but nothing worked. I wasn’t bringing my best self when I was stressed and pushing all day long. After my first daughter arrived, I prioritize my lifestyle in a way I had never done before and started my 3-day workweek, and things TOOK OFF. Never be afraid to do what makes sense for you, your family and your business. You know what’s best. Trust it. Get Guidance -- After switching to my 3-day workweek, I began to study other success women entrepreneurs with children and soon realized not a single one of them was doing it all by themselves. They had coaches, mentors, exec boards, masterminds and team members that would advise them, guide them and help them out. If you’re currently solopreneuring it, you can only get so far. (It took me 7 looong years to figure that out!) If you’re ready to uplevel and get the personal guidance you need to create full-time income working part-time hours, I’d love to explore working together. Book a chat here. Incremental Upgrades -- Don’t think everything has to change overnight! When we push ourselves too hard and too fast, we fall. (Just take a look at your kiddos to figure that out, right?!) Instead of quantum leaps, aim for incremental upgrades. Small, consistent, feel-good steps in the direction of your dreams. Sure, maybe you’d love to quit your full-time job, but right now it’s contributing financially -- so maybe an incremental upgrade could be requesting to work from home 1 day a week or get a half-day on Fridays. Maybe you’d love to bring on an assistant to help you, but are scared it’ll cost too much. Why not hire someone for just 5-10 hours a month? Start small and move consistently -- you’ll be surprised what a difference it makes. Lastly, I just want to remind you that you’re amazing, and you’ve got this. I believe in YOU. P.S. Not sure how to balance business, kids and life? One of the things I love most is helping women create a LIFESTYLE that feels amazing while building a business they adore. Ready for that? Let’s chat! Connect with a Tribe of Thriving female entrepreneurs! Are there days when you feel like there is simply not enough of you to go around? You know what you “should” do, but…doing it… well, that is another story. If you ever feel like that, I want to share something super special with you! You can learn how to take control of your life, personal and professional, while earning more and working less. Sound good? All you need is to learn new strategies and accept guidance. I’m SUPER excited to share an opportunity with you. One that offers you the chance to learn these strategies and where to find this guidance! I’d be completely honored to have you koin me and 21+ EXPERTS for a FREE Online Event & Gift Giveaway: Discover the keys to Create Time + Money Freedom! Also included in this event are 21+ free gifts loaded with tools and strategies that have been specifically designed to help you CREATE TIME + MONEY FREEDOM! This event has been designed with the busy female entrepreneur in mind! Every interview is a 30-45 minute audio clip. This makes it super convenient for you to listen to while you’re on the go. And all interviews are hosted by successful therapist and entrepreneur, Dr. Julie Merriman. There is hope. You do not have to dread and question yourself every day. You can make the difference! The experts on this special panel will blow you away with all the valuable strategies and tools they will share with you! You will network with other like-minded entrepreneurial women. You will become a member of an empowered tribe of women who are THRIVING and living a vibrant lifestyle! I have been there. I think all of us bold enough to start our own businesses have hit a wall every now and then. But, when we choose to come out of the shadows refusing to suffer in silence, we learn empowerment and to feel different. When we reach out, we realize we are not alone. There is a beautiful tribe of brave women here to validate our fears, but also, generously share their time-tested tools and strategies. And, the fact you’re reading this tells me this is important to you. Good for you! You can choose to reach out TODAY to this thriving and vibrant group of women to get the support you long for and deserve. During this Free Online Event and Gift Giveaway, you can tune in to discover strategies and tools to Create Time + Money Freedom while on the run, grabbing groceries, or snuggled in your comfy chair with a glass of vino. And, you will be in the company of thousands of other women entrepreneurs across the world who desire to a thriving, vibrant lifestyle. Imagine, this year, making more money and having more time to create your own thriving, vibrant lifestyle! It IS possible. Most importantly all these valuable strategies and tools are available to you for FREE. That is right, no cost to you! I can’t wait for you to join me for this incredible event. P.S. I know you are wondering how this event will be any different. But please trust me when I say, you can expect sound expert advice and professional gifts that could honestly change how you are experiencing your life. Even better, you have nothing to lose, and everything to gain! Join me and thousands of women here.